Canton Master Warehouse Distributor - All Canton Products Available. 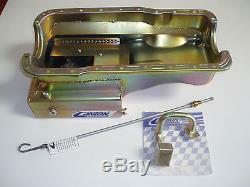 Canton Front Sump 351W Oil Pan Kit - 12 Wide 14 Gauge Gold Iridited Street/Strip/Road Race Oil Pan. WITH THIS CANTON OIL PAN KIT. 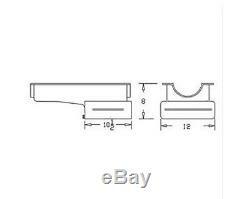 20-850 Universal Dipstick 1/4 NPT Fitting. Please review the details section below to verify this will fit your application. FEATURES: This front sump road race pan is for Ford 351 Windsor blocks. It has a 8 quart system capacity, 8" deep, 12" wide, 14 gauge sump designed with 14 gauge steel for Cobra kit cars. Will work with stock & aftermarket starters. The Pan Features: Diamond Shape Road Race Baffle Assembly With Four Trap Doors Crank Scraper Removable Windage/Anti-Slosh Baffle 1/2 NPT Temperature Bung Provision For Our Pan Mounted Dipstick Magnetic Drain Plug Recommended / Optional parts: #21-062 - 351W Main Girdle with ARP Bolts #20-962 - 351W Windage Tray for use with Canton Main Girdle #20-933 - 351W. Front Sump Windage Tray Only #20-854 - Universal Steel Braided Dipstick Kit 1/4 N. Fitting #88-650 - Small Block Ford 351W Four Piece Oil Pan Gasket. We do not lower invoice values since it is a violation of US and International custom laws. Let us work to resolve your problem so everyone is happy. Suite D7 Costa Mesa, CA 92627. And no repairs will be provided, nor labor charges covered by TREperformance Inc. The item "Canton Ford 351W Road Race 8 Quart Front Sump Oil Pan Steel Cobra Kit 15-680S" is in sale since Saturday, December 24, 2016. This item is in the category "eBay Motors\Parts & Accessories\Car & Truck Parts\Engines & Components\Oil Pans". The seller is "treperformance" and is located in Costa Mesa, California. This item can be shipped worldwide.